« Purple Carrots Drama Studio: Inclusive Summer Drama Camps specializing in children, youth and adults with different learning abilities. SKETCH invites the public to participate in Mas Camp! We’re opening our doors to the public for a special collaborative community arts project with renowned contemporary artist Marlon Griffith! Make masks, costumes and accessories from July 13 to August 6–all to be featured in the Ring of Fire Street Procession on Sunday, August 9. 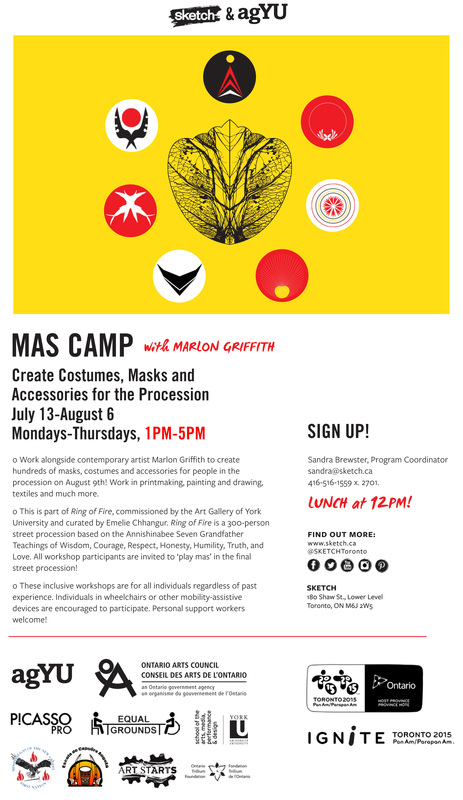 All those who participate in the workshop are invited to ‘play mas’ in the Procession! Commissioned by the Art Gallery of York University, Ring of Fire is a 300-person strong street procession by Marlon Griffith, staged at the TO2015 Parapan American Games on Sunday, 9 August 2015 along University Avenue, from Queens Park to City Hall. Curated by Emelie Chhangur. To sign up, contact Sandra Brewster, Market/Gallery Coordinator, at 416-516-1559 ex. 2701 or sandra@sketch.ca.